Vitagerpavac: Herpetic culture inactivated vaccine, lyophilisate for preparing solution for intradermal administration. Description: Amorphous mass from light yellow to pink. Hygroscopic. Immunological properties: The vaccine stimulates the cellular mechanisms of the resistance of the human body to the herpes simplex virus Ι and ΙΙ types. Ingredients: One vaccination dose (0.2 ml) contains: Active ingredients: specific herpes simplex virus (HSV) antigens Ι and ΙΙ types (strain US and strain HV, respectively), obtained by reproduction in cultured cells kidney of an African green monkey (VERO B), inactivated by formaldehyde and lyophilized with the addition of a sucrose-gelatin medium as a stabilizer. Excipients: formaldehyde not more than 200 µg / ml; gentamicin sulfate is not more than 40 μg / ml, sucrose is not more than 0.075 g / ml; Gelatosis is not more than 0.01 g / ml. 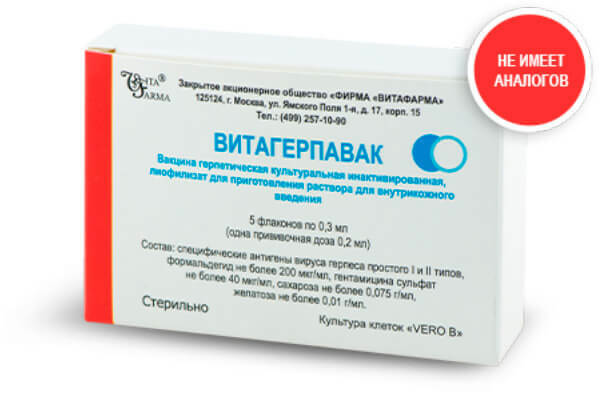 Purpose: Prevention of recurrence of herpetic infections caused by the herpes simplex virus types I and II. Vaccination is carried out in medical institutions for the purpose and under the supervision of a physician. The vaccine is used in remission, not earlier than 10 days after the complete disappearance of the clinical manifestations of herpes infection. The contents of the vial are dissolved in 0.3 ml of solvent (sterile water for injection). To do this, the solvent using a syringe with a needle is placed in a bottle with a vaccine, which is then shaken to dissolve the contents. The dissolved product should be a slightly opalescent pink or pink liquid with a yellow tint. Visible mechanical inclusions should be absent. Dissolved vaccine is not subject to storage. The drug is not suitable for use in vials with impaired integrity, labeling, when the color changes, expired, if not properly stored. The opening of the bottle, the dissolution of the drug and the vaccination procedure is carried out with strict observance of the rules of asepsis. The drug is administered intracutaneously in the region of the inner surface of the forearm in a single dose of 0.2 ml (control - the formation of "lemon peel"). The course of vaccination for herpes infections of the skin and mucous membranes consists of 5 injections, which are carried out with an interval of 7 days. Patients with complicated herpes infection (relapses 1 or more times a month) repeat the second and subsequent injections with an interval of 10 days. After 6 months, a second course of vaccination is carried out (5 injections). Side effect: After the introduction of the vaccine in individuals may develop local and general reactions. Local reaction: manifested by hyperemia of the skin with a diameter of up to 2 cm during the first day and a weak short-term burning sensation at the injection site. The general reaction can be expressed in a slight increase in temperature (not higher than 37.5 ° C), weakness, passing without treatment. In the event of more pronounced local and general reactions or the development of an exacerbation of the recurrence of a herpetic infection, administration of the drug should be suspended. Vaccination can be continued 14 days after the complete disappearance of the clinical manifestations of herpes infection and the general reaction to the vaccine. Interactions with other drugs: Cases of incompatibility with other drugs have not been identified. Contraindications: 1. Herpetic infection in the active stage (relapse). Vaccination is carried out not earlier than 14 days after the disappearance of clinical manifestations. 2. Acute infectious and non-infectious diseases. Vaccination is carried out no earlier than 30 days after recovery. 3. Chronic diseases in the stage of exacerbation or decompensation. 4. Malignant neoplasms. 5. Pregnancy. 6. Allergy to gentamicin and other antibiotics of the aminoglycoside group. Product form: In bottles of 0, 3 ml. One vaccination dose - 0.2 ml. In a pack of 5 bottles and instructions for use. Shelf life: 2 years. The drug expired use is not subject to. Conditions of transportation: The drug is transported in accordance with SP 3.3.2.1248-03 at a temperature of from 2 to 8 ° C. Short-term, no more than 3 days, transportation at a temperature from 9 to 18 ° C is allowed. Do not freeze. Storage conditions: The preparation is stored in accordance with SP 3.3.2.1248-03 at a temperature of 2 to 8 ° C, out of the reach of children. Vacation conditions: Available by prescription.